Texas League pitchers have not been able to figure out Myles Straw this season. The Astros' No. 20 prospect frustrated them again on Saturday, going 5-for-5 with a pair of doubles, three runs scored and a stolen base in Double-A Corpus Christi's 7-2 win over Tulsa at Whataburger Field. It's his second five-hit game this season, with the center fielder also going 5-for-5 on April 21 against Frisco. After leading off the first, third and fifth innings with singles, the 2015 12th-round pick roped a double to right field in the seventh and capped his night by driving a ball down the first base line for another double the next frame. The five-hit performance raised his average 19 points to .362, which ranks second in the league behind teammate Randy Cesar, who sits at .367. The California native is also third in the league with a .459 on-base percentage -- trailing Tulsa's Connor Joe (.464) and teammate Taylor Jones (.460) -- and ranks second with 30 walks and 34 runs scored. His perfect night came after he hit .211 with one RBI over his previous six games. "We've been taking a lot of swings [in batting practice] lately, but today I took less," Straw said. "For a lot of the guys, it was kind of light and it was more relaxing and not taking so many swings in the cage and on the field. My body felt better." The 23-year-old earned a brief callup to Corpus Christi last year after hitting .295/.412/.373 at Class A Buies Creek, but he struggled in the late-season stint, batting .239 with a .579 OPS over 13 games. Despite the numbers, Hooks hitting coach Troy Snitker said he wasn't worried in the slightest about Straw starting the season in Double-A. "It's not anything we didn't think he'd be able to accomplish and we didn't think it was going to be an issue for him to overcome this level," Snitker said. "He has good enough skills and he's had good enough at-bats off quality stuff. I don't think it was anything we were worried about, doing the same thing at this level. We were confident he was going to have this success. "He's got a lot of skills that play at any level. He's just got skills and tools that play across the board. I don't think it's surprising. He's just continued to develop and sharpen those skills that he already had, and his performance has just been consistent across the board and has continued to get better." Part of what's made Straw such a pest for pitchers is his elite speed and disciplined plate approach, and he's developing the ability to hit the ball harder. "If he just gets on, if he singles or he walks, it's a double every time," Snitker said. "But I don't think it's as much that he's not capable of driving the ball a little more, or if he were to decide to just worry about the amount of contact [he's] making, 'I'm just going to capitalize on the quality of contact and drive the ball and burn guys,' I don't think he wouldn't be able to do that. I just think he's understanding of his complete tool set and understands the best way that he can impact the game. And with his speed, there's no reason for him to sacrifice contact for power when he can just steal a bag and turn a single into a double anytime. "I think he's kind of figured out the best way for him to impact a game is swinging at strikes and taking all the walks when guys are out of the zone and turning a high amount of contact by using his legs." With his 31st stolen base, he has eight more than any other Minor Leaguer. Corpus Christi leads all teams with 78 and Buies Creek -- the Astros' Class A Advanced affiliate -- is second with 73. After his previous five-hit night, Straw told MiLB.com that he wanted to steal at least 80 bases this season and hoped to get to 100. He's currently on pace for over 90. "I've had people say ... growing up, saying, 'Oh, I wish I had your speed,'" Straw said. "I feel like I'm blessed with it, and it's a big part of my game. I can hit a ball on the ground, and more times than not, I feel like I have a chance. I feel like I'd be a totally different player. [Speed is] what makes me the player I am." 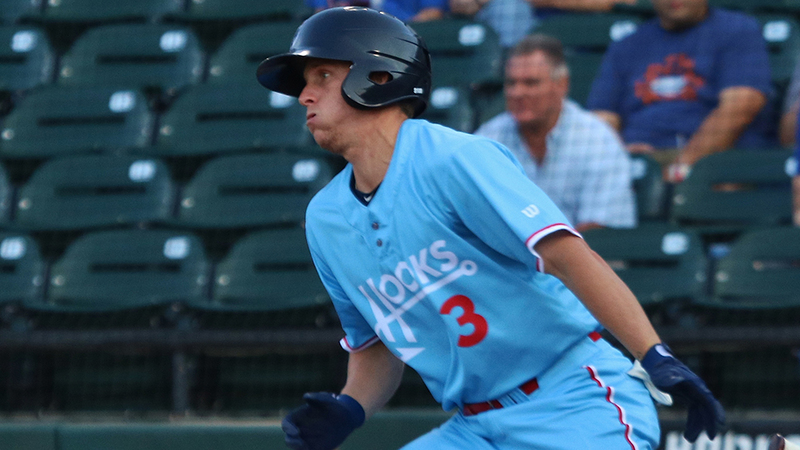 But he's been most impressed with the Hooks' team success on the bases, which is in large part due to first base coach Mycal Jones, who provides them with pitcher tendencies and pointers on how to swipe bags. "I'm going to give all the credit to that guy," Straw said. "He gives us lots of information. Having him makes it a million times easier." Alex De Goti hit a three-run homer for the Hooks, and Cesar was 3-for-4 with an RBI. Josh Horton is a contributor to MiLB.com. Follow him on Twitter @joshhortonMiLB This story was not subject to the approval of the National Association of Professional Baseball Leagues or its clubs.